KJV Baby's New Testament w/Psalms-White Imitation Leather. Save 30%. Regular retail $6.99. Save 30%. Make a promise to the new baby in your church family, and share God's Word with them. There's not a more thoughtful gift! 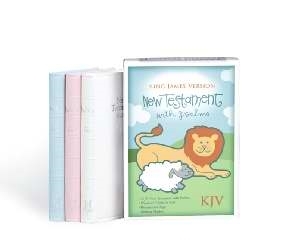 This red-letter edition New Testament also includes Psalms and is perfect for presentation on baby dedication day.